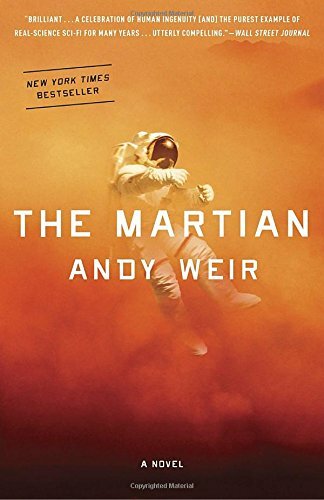 One of my favorite books of the year is The Martian by Andy Weir. I enjoyed it so much that I haven't stopped recommending it to anyone willing to listen and I've given it to multiple people as gifts. My friend Stu says it's the best book he's ever read. He's a full-fledged adult who has read quite a few books, so this is no idle boast. After my recommendation, he downloaded it for a business trip and he found himself unable to put it down. However he continues to surprise me in that he hasn't yet killed himself in one of his many real-life adventures barreling through life, so take the hyperbole in the context of someone whose life is hyperbole. I also gave this book to one of my nephews for Christmas. He finished it in two days. My wife started reading it yesterday. She can't stop reading it. NASA has successfully initiated manned missions to Mars. I know, it's fiction, but just imagine that the U.S. Government has actually funded NASA to be able to do that. Suspension of disbelief. Six days into the third such mission, Mark wakes up to find himself wounded and stranded due to a freak accident during an emergency evacuation. His crew has left him for dead. He has no way to communicate with anyone. All he has are his wits, his crew's leftover supplies and equipment, and whatever he can find in a barren landscape that seems to want to kill him at every turn. This happens to include his crewmates' leftover collection of 70's TV and disco. I imagine it's almost like being left in the Australian outback without oxygen. The action moves at a breathtaking pace as you find yourself balancing your feelings of dread when you realize the seeming hopelessness of Mark's situation with your hope and faith in his combination of smarts, optimism, and sheer resourcefulness. Yes, I have a man-crush on Mark Watney, and you will, too. This is a thrilling page-turner that should appeal to anyone who enjoys celebrating human ingenuity. It's been described as "Robinson Crusoe on Mars" which seems apt. It is a rare hard-science fiction book where the fundamentals of science are in full effect, well-explained, and never boring. I could imagine this book being part of summer reading for high school. Science teachers, please take note! This is Andy Weir's first novel. I think he's going to have a hard time topping this, but I look forward to his next one. Of course, this has been fast-tracked to be a star-studded movie that's scheduled to be released in 2015. My suggestion is to read the book beforehand.